Engineers from Rice University have discovered the ideal architecture for storing hydrogen in "white graphene" nanomaterials - a design similar to a Lilliputian skyscraper with "floors" of boron nitride stacked one atop the other and held precisely 5.2 Å apart by boron nitride pillars. The details of the research can be found in the journal Small. The motivation is to create an efficient material that can take up and hold a lot of hydrogen - both by volume and weight - and that can quickly and easily release that hydrogen when it's needed. Rouzbeh Shahsavari, Lead Author & Assistant Professor of Civil & Environmental Engineering - Rice. Hydrogen is the most plentiful element and lightest in the universe, and its energy-to-mass ratio -- the amount of available energy per pound of raw material, for instance -- far surpasses that of fossil fuels. It is also the cleanest approach to produce electricity: The only derivative is water. A 2017 report by market analysts at BCC Research found that international demand for hydrogen storage materials and technologies will probably reach $5.4 billion per year by 2021. Hydrogen's main disadvantages relate to storage, portability, and safety. While large volumes can be stored under high pressure in specifically designed tanks and underground salt domes, small-scale portable tanks – similar to the size of an automobile gas tank - have thus far eluded engineers. After months of calculations on two of Rice's fastest supercomputers, Shahsavari and Rice graduate student Shuo Zhao discovered the ideal architecture for storing hydrogen in boron nitride. One form of the material, hexagonal boron nitride (hBN), comprises atom-thick sheets of nitrogen and boron and is occasionally called white graphene because the atoms are spaced precisely like carbon atoms in flat sheets of graphene. 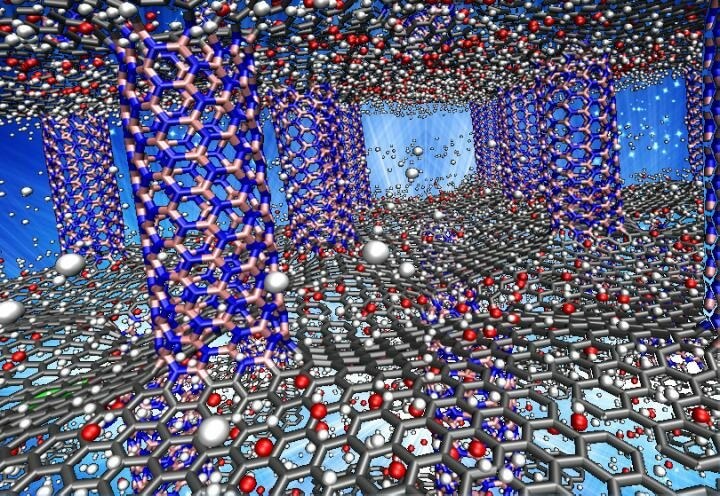 Earlier work in Shahsavari's Multiscale Materials Lab found that hybrid materials of boron nitride and graphene could hold sufficient hydrogen to meet the Department of Energy's storage goals for light-duty fuel cell vehicles. "The choice of material is important," he said. "Boron nitride has been shown to be better in terms of hydrogen absorption than pure graphene, carbon nanotubes or hybrids of graphene and boron nitride. "But the spacing and arrangement of hBN sheets and pillars is also critical," he said. "So we decided to perform an exhaustive search of all the possible geometries of hBN to see which worked best. We also expanded the calculations to include various temperatures, pressures and dopants, trace elements that can be added to the boron nitride to enhance its hydrogen storage capacity." Zhao and Shahsavari set up many "ab initio" tests, computer simulations that applied first principles of physics. Shahsavari said the method was computationally intense but worth the additional effort because it rendered the highest precision. "We conducted nearly 4,000 ab initio calculations to try and find that sweet spot where the material and geometry go hand in hand and really work together to optimize hydrogen storage," he said. In contrast to materials that store hydrogen through chemical bonding, Shahsavari said boron nitride is a sorbent that stores hydrogen through physical bonds, which are feebler than chemical bonds. That's a benefit with regards to getting hydrogen out of storage because sorbent materials are inclined to discharge more easily than their chemical cousins, Shahsavari said. He said the choice of boron nitride tubes or sheets and the corresponding spacing between them in the superstructure were fundamental to maximizing capacity. "Without pillars, the sheets sit naturally one atop the other about 3 angstroms apart, and very few hydrogen atoms can penetrate that space," he said. "When the distance grew to 6 angstroms or more, the capacity also fell off. At 5.2 angstroms, there is a cooperative attraction from both the ceiling and floor, and the hydrogen tends to clump in the middle. Conversely, models made of purely BN tubes -- not sheets -- had less storage capacity." Shahsavari said models revealed that the pure hBN tube-sheet structures could hold 8 weight percent of hydrogen. (Weight percent is a measure of concentration, akin to parts per million.) Physical experiments are required to confirm that capacity, but that the DOE's eventual target is 7.5 weight percent, and Shahsavari's models indicate even more hydrogen can be stored in his structure if trace quantities of lithium are incorporated to the hBN. Finally, Shahsavari said, anomalies in the flat, floor-like sheets of the structure could also prove beneficial for engineers. "Furthermore, the high thermal conductivity and flexibility of BN may provide additional opportunities to control the adsorption and release kinetics on-demand," Shahsavari said. "For example, it may be possible to control release kinetics by applying an external voltage, heat or an electric field."